My sister heard about my adventures at Shabusen and Kyo and wanted to try grilling meat for herself, so I suggested that we head to Charcoal Sushi & BBQ Restaurant in central Richmond. Who doesn't like hot food on a hot day? In addition, my parents wanted to watch the FIFA World Cup, so Charcoal Sushi seemed to be the best choice to satisfy all of our needs. My sister could grill meat and my parents could watch the World Cup on one of the TVs in the dining area while I sat in the corner scribbling notes about the food into my notebook. 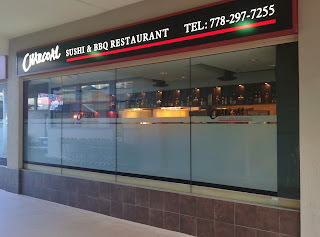 Charcoal Sushi & BBQ Restaurant is Chinese-owned and features a moderately small dining space where each table has its own BBQ grill in the middle. We received a warm, friendly welcome upon entering the restaurant and were lucky enough to get one of the last free tables without a reservation. The restaurant was completely full just mere minutes after our arrival, which I found surprising considering that it was a Tuesday evening. 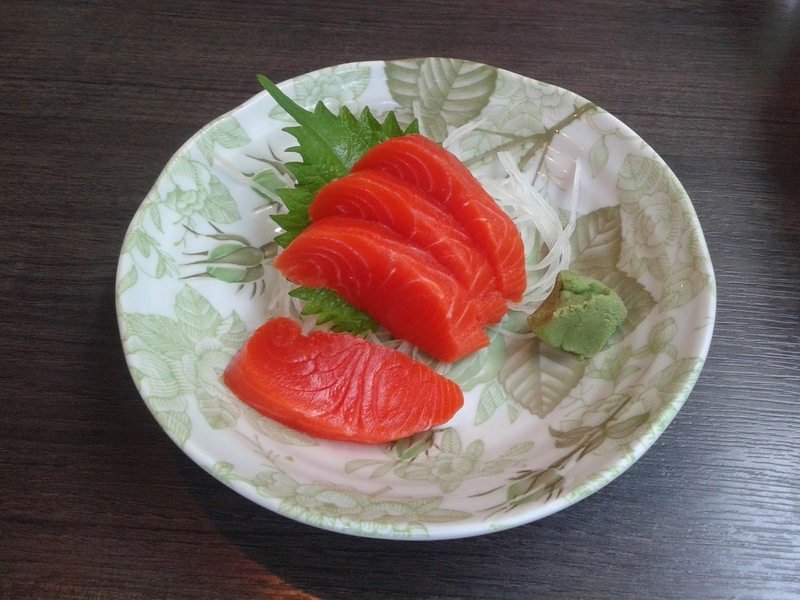 The first dish to arrive at our table was the Sockeye Salmon Sashimi. I was pleasantly surprised by the freshness of the salmon, which gave it an enjoyable sweet flavour. The size of each piece was just perfect in my opinion. My dad liked it so much that he insisted that we get one more order (which we did at the end of the meal). The Ebi Mayo came with four meaty, toothsome battered shrimps. A small amount of spice was added to liven flavours up along with the mayonnaise. The batter was light and rather crunchy. The Madness Roll consisted of imitation crab, avocado, salmon tempura, tuna, green onion, and sesame seeds. 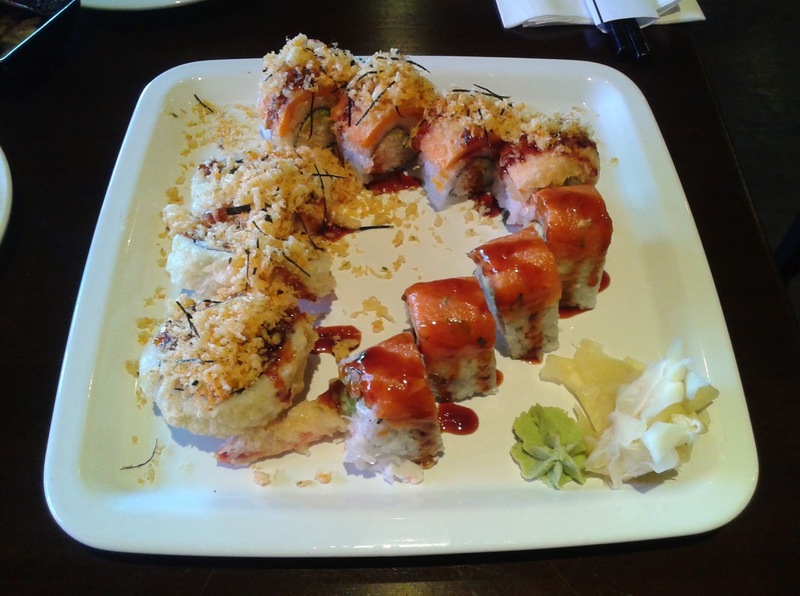 The salmon in the salmon tempura was mediocre in freshness and execution, while the crab and avocado inside the roll had a decent harmonized sweetness. 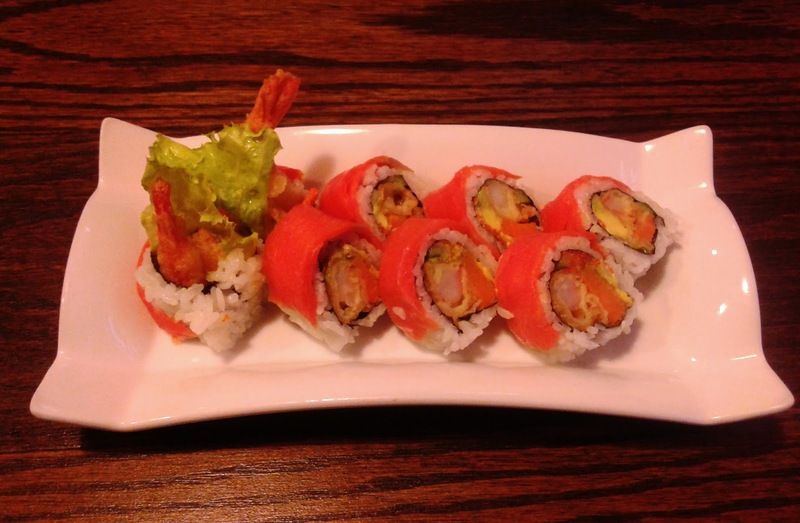 The roll was served with spicy tuna instead of tuna, but this worked out alright in terms of taste. 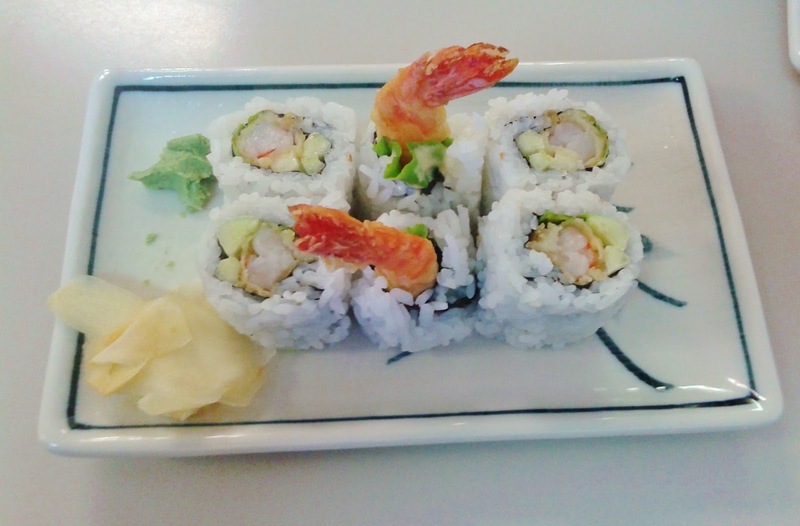 The Dragon Roll came with prawn tempura, cucumber, eel, and avocado. There was a good amount of unagi on top, but the taste of the unagi was someone masked by the large amount of cucumber inside the roll. I found the tempura batter a bit too crunchy and the sushi rice slightly dry. The BBQ Beef Tongue arrived with seven thin slices of beef tongue garnished with sesame and green onion. 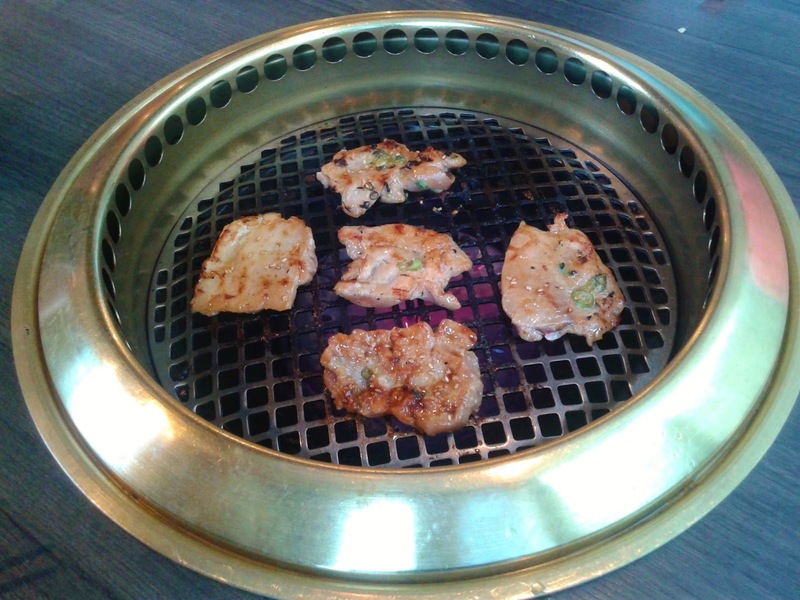 The marinade gave the beef enough flavour, and I enjoyed the nice rebound of the beef tongue after grilling. 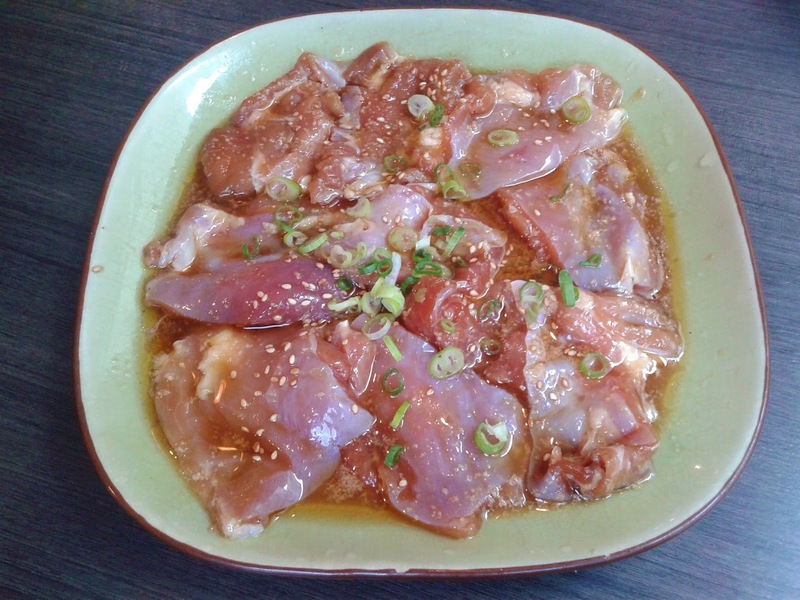 The BBQ Boneless Chicken came with approximately nine pieces of marinated chicken. The raw form of the chicken was not particularly photogenic, but if you absolutely must see it, click here. I liked how the chicken was cut into thin slices to make the grilling easier. 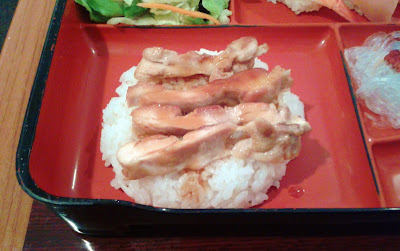 After grilling, the chicken was quite tender and had a sweet teriyaki flavour. My sister really enjoyed the process of grilling meat and wanted to get more beef to grill, but I wanted to get something different, so I went with the Beef Teriyaki with Rice. Perhaps I should have stuck with her suggestion instead, because eating the beef teriyaki was like playing a game of Russian Roulette. There were the good pieces of beef, and then there were those very-elasticky-and-virtually-impossible-to-chew pieces. By the comments that ensued, I conclude that the tooth-tiring pieces outnumbered the tooth-friendly pieces. 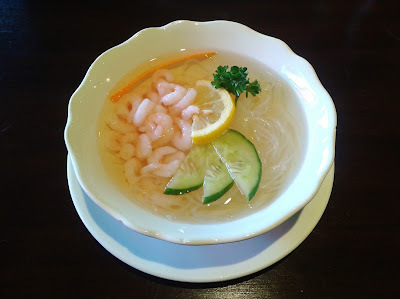 The service was some of the best I had ever received from a Chinese-operated restaurant. The servers were glad to change the channel for us so that we could watch the world cup and remained friendly and attentive throughout our visit. I found the prices to be reasonable (considering the fact that we were in Richmond) and the lively atmosphere to be quite suitable for small-scale celebrations. Other than the Russian Roulette Beef Teriyaki, the other dishes showed a decent level of care in preparation and execution. 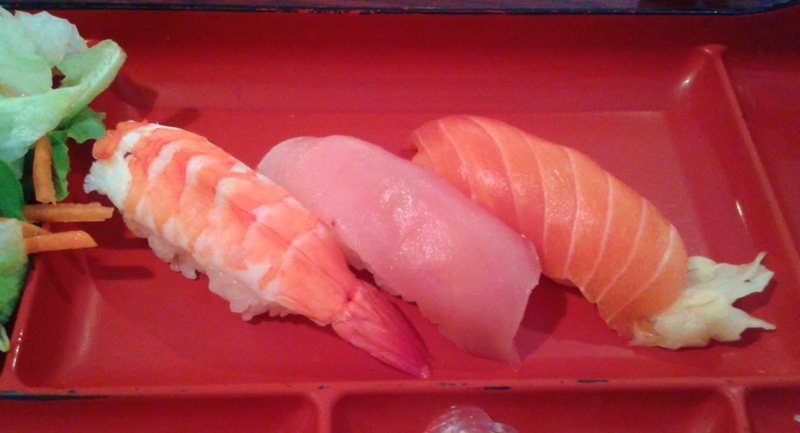 Selecting a sushi restaurant in Richmond has always been a challenge for me. You can either get good prices or good ambience, but it is nearly impossible to get both. 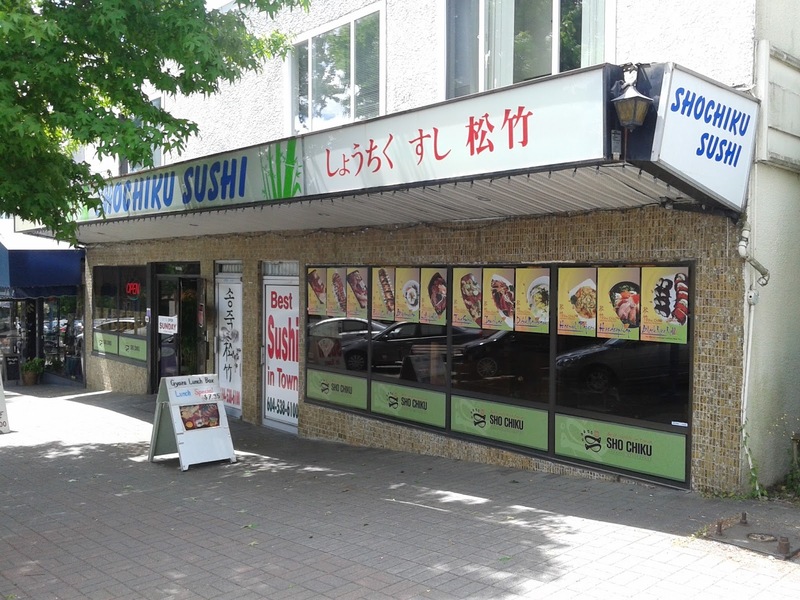 Furthermore, most of the better sushi restaurants in Richmond seem to be located away from the "Sea of Malls." For the sake of convenience, I decided to risk it for the biscuit and try out one of the sushi restaurants within the Sea of Malls. I tried my best to look for some kind of combo which would allow me to sample everything, and the Seto Box from Seto Sushi was the closest thing I could find. 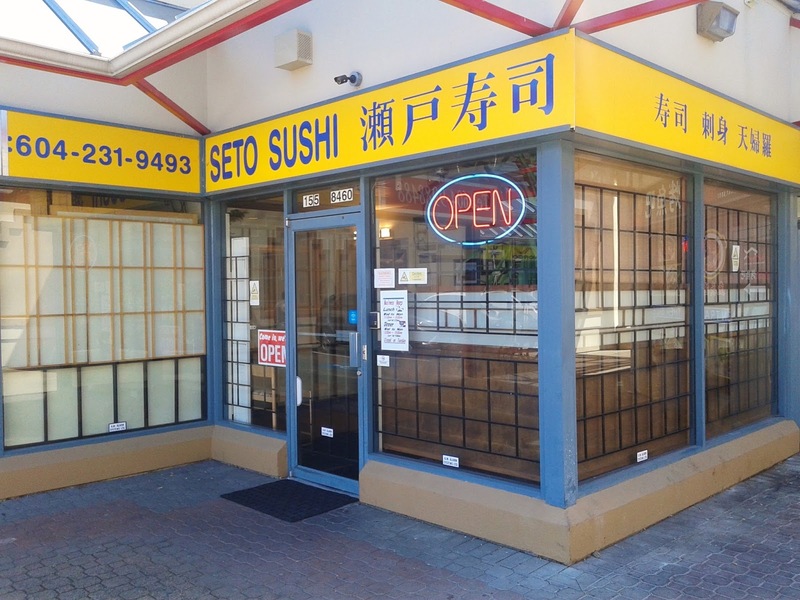 Seto Sushi is a large, authentic Japanese restaurant located just across the street from the north face of Lansdowne Mall. There is a focus on traditional items as well as a very large selection of raw seafood. The seating arrangements were quite comfortable and allowed for some privacy without the feeling of seclusion. I glanced over my head and saw the sign for Bluefin Tuna Nigiri, and if I remember correctly, the prices were $4.50 for a piece of Akami, $6 for a piece of Chutoro, and $9 for a piece of Otoro. The Seto Box came with Miso Soup, Zarusoba, Appetizer Tempura, Chicken Teriyaki, Tako Sunomono, Salmon Sashimi, Tuna Sashimi, 3 pieces of nigiri sushi, and a salad. The Miso Soup was served piping hot with seaweed, tofu, and green onion. I liked the richness of the miso paste, but I found the soup slightly too salty. 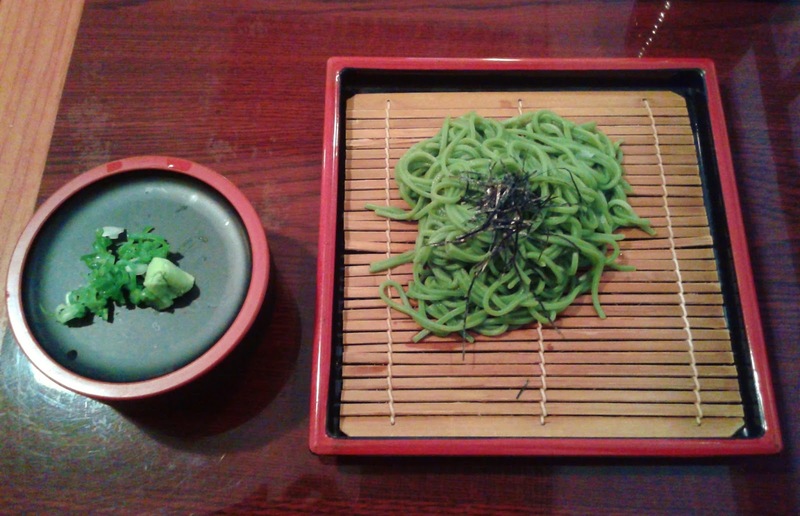 The Zarusoba (cold green tea buckwheat noodles) came with a light soy dipping sauce (soba tsuyu) in the container on the left. 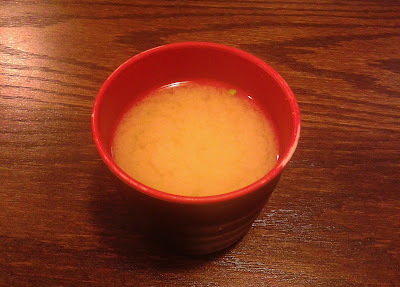 I liked the mild soy sauce flavour of the dipping sauce as well as the rebound of the soba noodles. The seaweed was also a nice complement - if only there was more of it! 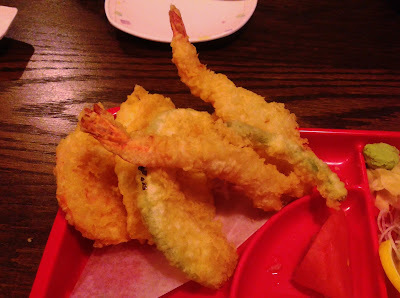 The Appetizer Tempura came with two prawns, one piece of zucchini and one piece of yam. 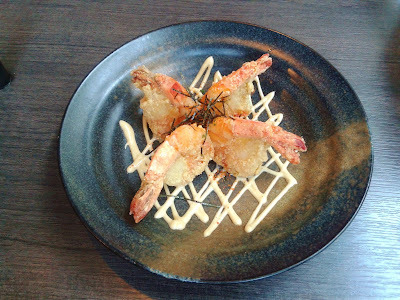 The prawns were large and meaty, while the surrounding batter was crispy without being hard. The dipping sauce has a mild gingery kick to it. 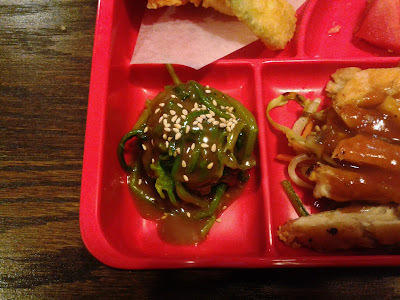 The Zucchini Tempura was juicy and delicious, while the Yam Tempura was cut too thick and only mildly sweet. The remainder of the Seto Box came in a lunch box. 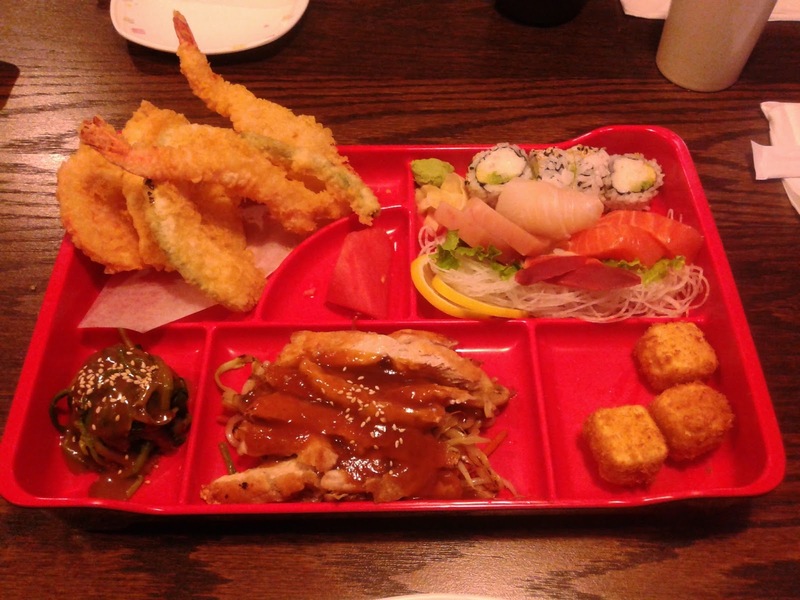 This is one heck of a filling lunch set! The Salad consisted mostly of cabbage leaves. The vinaigrette was light in flavour and didn't really make it all the way to the bottom. The Ebi Nigiri was quite chewy and contained slightly too much wasabi for my taste. 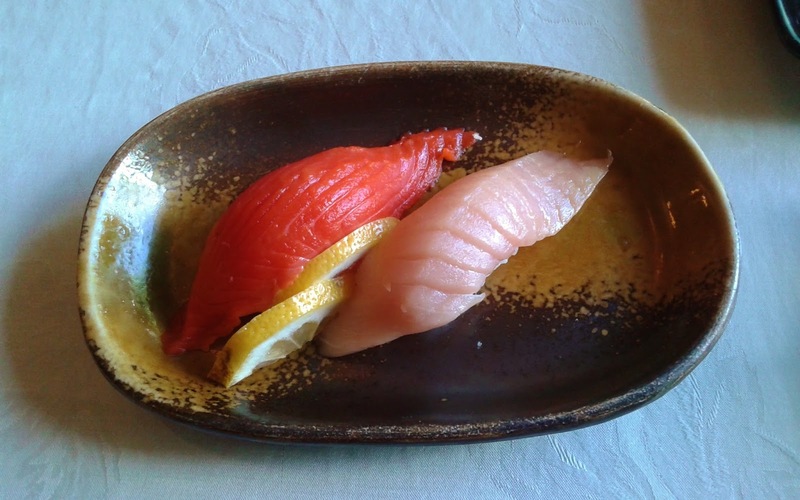 The Tuna Nigiri melted in my mouth nicely despite being thin, while the salmon in the Salmon Nigiri seemed to lack freshness. However, the sushi rice was well constructed and didn't fall apart too easily. The Chicken Teriyaki came with lightly pan-fried chicken with a circular bed of rice. The chicken was sufficiently tender, and this was a good filler. It would be excellent if it had slightly more teriyaki sauce. The Tako Sunomono had a light vinegary flavour. The one piece of tako had just the right amount of chewiness and flavour to it. Albeit small, this was a nice, refreshing appetizer. 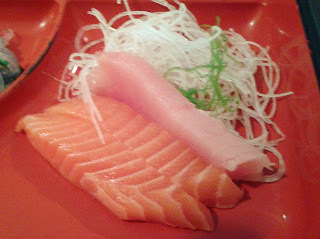 The Salmon Sashimi did not come in large pieces, although each piece was quite thick. 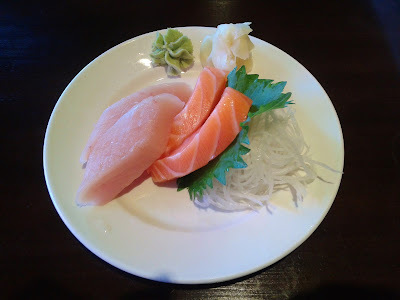 Like the Salmon Nigiri, the Salmon Sashimi was not the freshest either. I guess I just came on a bad day. 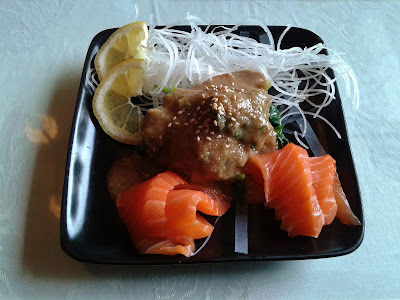 The Tuna Sashimi, on the other hand, was quite soft and substantially fresher than the salmon. The Shima-Aji Nigiri (striped jack) came with a large, thick cut and sufficient sweetness. 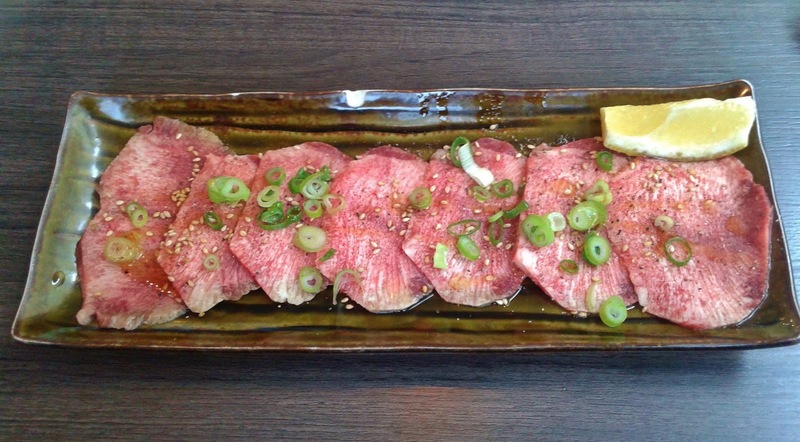 I originally wanted to order all three cuts of bluefin tuna, but not wanting to endanger the species or my wallet any further, I only ordered one piece of the otoro (the fattiest, juiciest cut). It came in quite a generous portion with a very smooth, melt-in-your-mouth texture. The flavour was perfect, and it was so soft that the fish fell apart more than the rice. 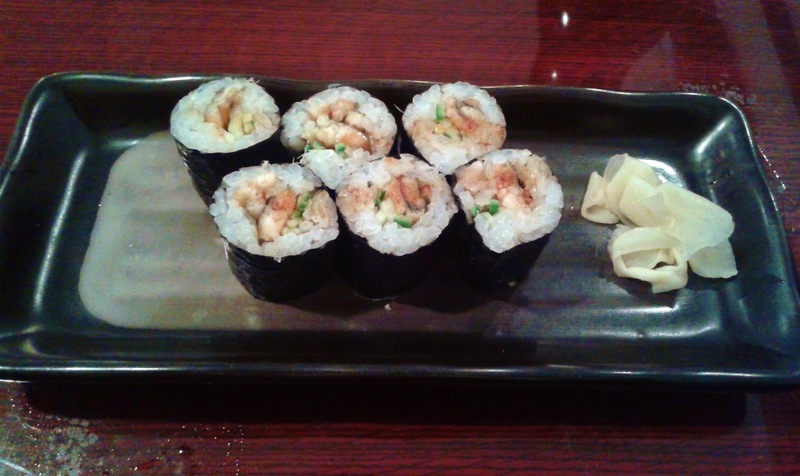 The Anakyu Roll came with anago (sea eel) and cucumber in a hosomaki roll. The anago had a decent amount of sweetness, and the roll was well constructed, but the flavour of the anago got lost in the roll. 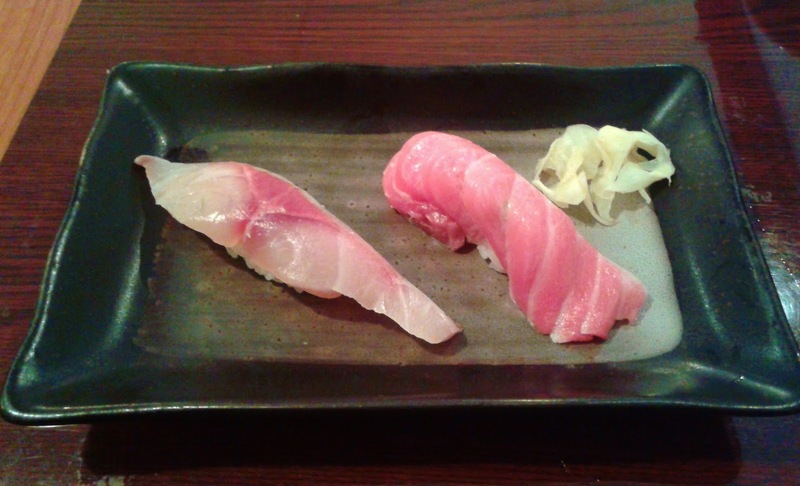 Perhaps the only good way to enjoy anago is in nigiri form. I found the service neither very good nor very bad, but there was an adequate level of attentiveness. 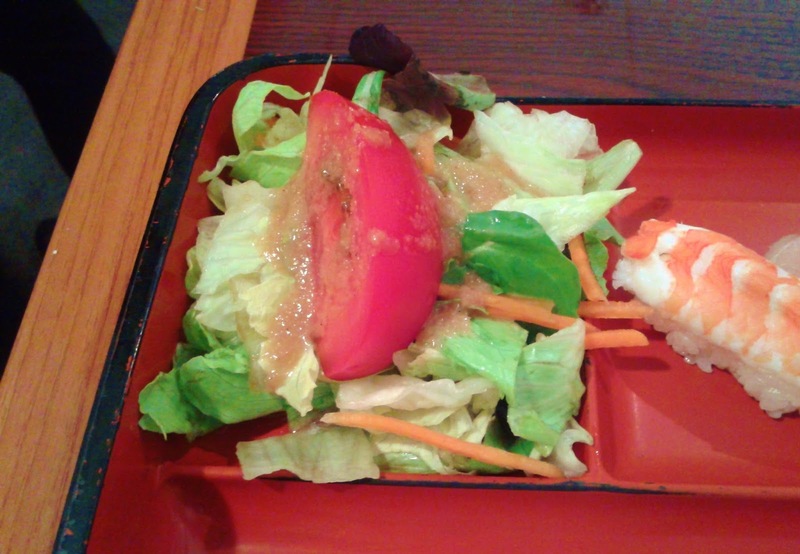 As expected of a higher-priced restaurant, the food was prepared with care. If the catch of salmon had been fresher, this would have been an excellent lunch. Lunch appears to be fairly priced at Seto Sushi, especially with the help of the lunch sets. Overall, I would consider this lunch a risk-it-for-the-biscuit success. 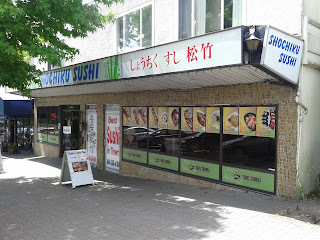 In the midst of all the hot weather, I decided to venture out to one of the cooler places in Greater Vancouver to have sushi. My cooler place of choice was White Rock, where strong breezes rage perpetually, necessitating a jacket at virtually all times. 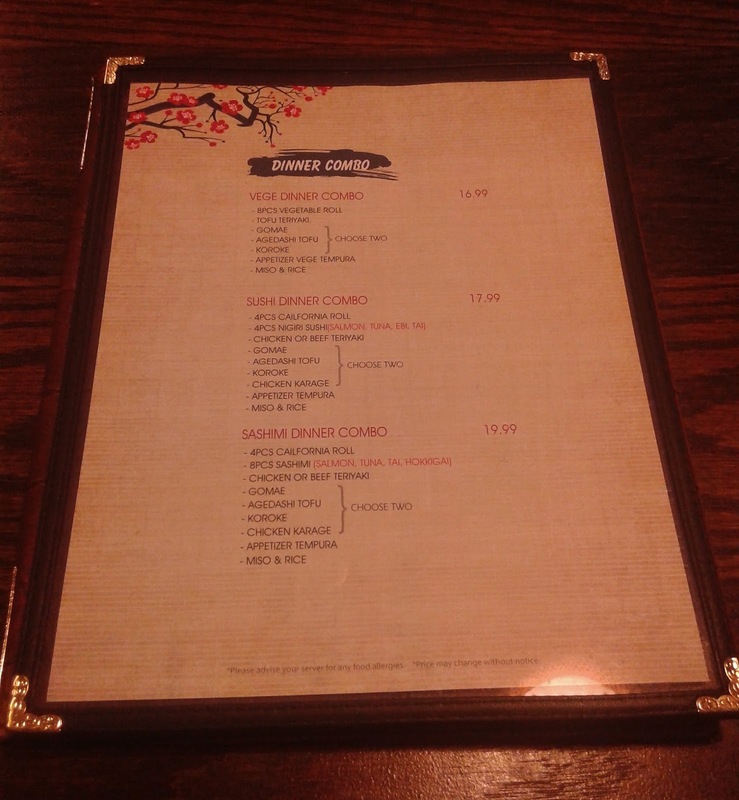 I perused a few online menus and selected Shochiku because it had one of the largest and most interesting menus. 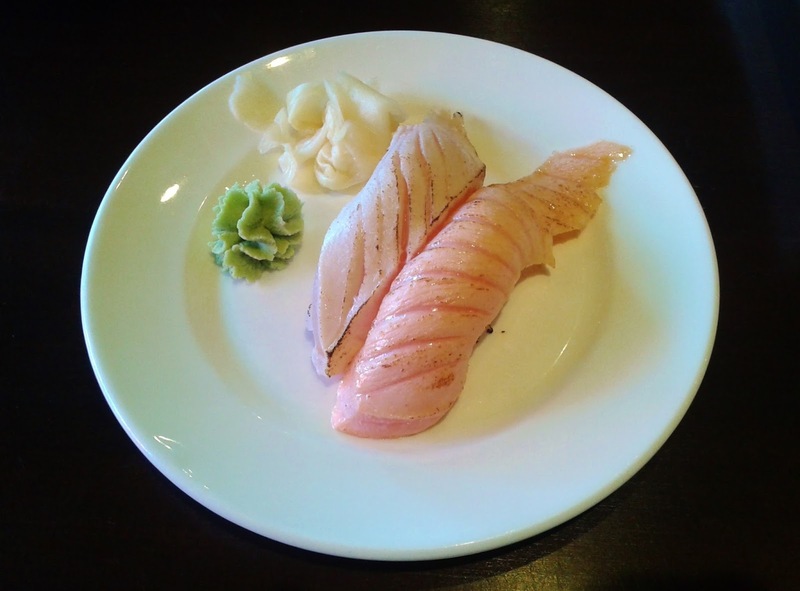 After all, there are not that many places where you can find Salmon Gomae. Furthermore, the words "Best Sushi in Town" were plastered in big red letters on one of the doors. They had me sold. Despite being a relatively new restaurant (opened in 2012), the restaurant has a slightly dilapidated appearance. They didn't appear to spend much on interior renovations either. However, the dining area is spacious with a home-like feel, and I found the seating quite comfortable. The presence of several Korean dishes on the menu suggests to me that the restaurant is Korean-operated. 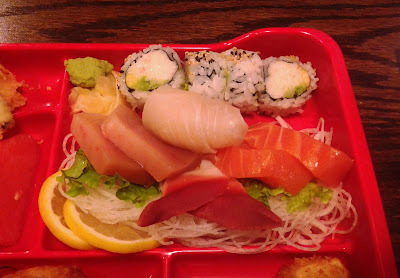 Served with four pieces of salmon sashimi, the Salmon Gomae came in a very large portion and was well worth the $5.95. The salmon was fresh with the desired sweet and buttery flavour. The gomae was average with large and rather chewy spinach leaves. 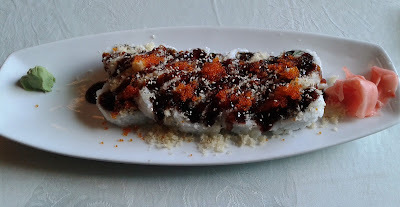 With the mindset that a restaurant would probably name its best roll after itself, I went with the Shochiku Roll, which consisted of deep fried eel, scallop cucumber, crispy crumbs, and tobiko. The crispy crumbs were well made without being hard. 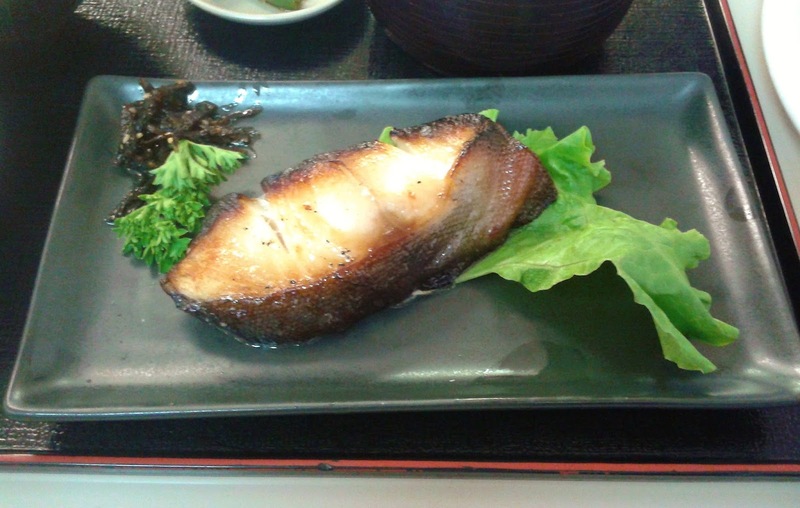 The unagi, although not particularly rich in flavour, was served nice and hot, and the scallop was quite savoury. I found the rice slightly mushy. Overall, the flavours worked well together and the roll tasted quite good if you are not too picky on details. 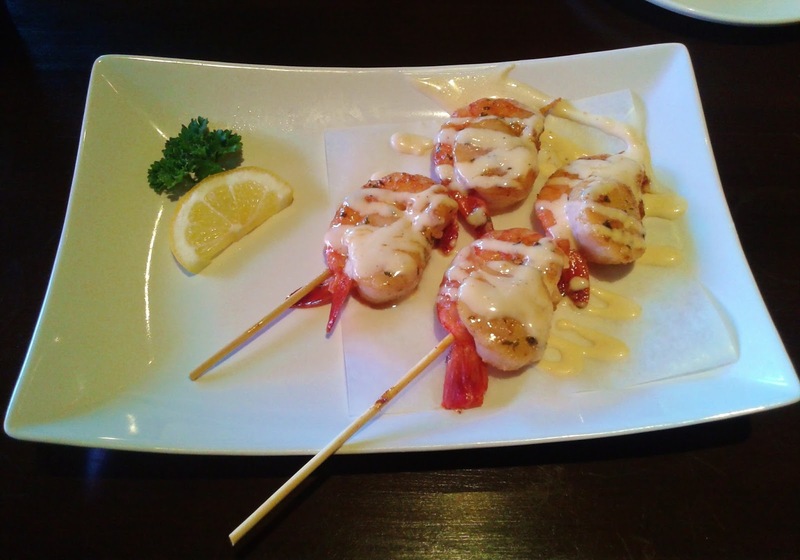 My favourite item of the meal was the Prawn Scallop Butter Yaki, which came with four scallops each cradled in a prawn. I enjoyed the rich, buttery flavours of the prawn and the scallop, and the prawns had a nice snap. I found the service quite friendly throughout my visit. 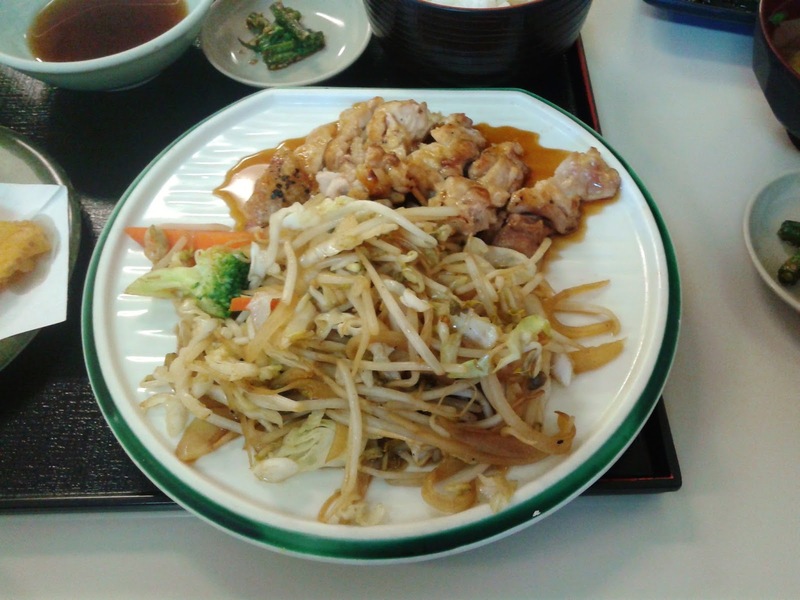 With regard to the food, Shochiku does a good job of matching flavours together, but their sushi rice needs to improved. The prices were quite reasonable, and the portion sizes were quite good. After finishing my food, I headed to Langley, which was basking in sunlight and too hot for even a T-shirt. Well, at least I can claim a free slurpee at 7-Eleven using my Scotiabank card! Arriving at 6:30 p.m. on a Tuesday, I expected the restaurant to be full, but that was not the case. In fact, the restaurant was nearly empty. The interior decor isn't much better than Sakura Sushi, and it was quite cold inside due to the strong air conditioning. There was also a limited assortment of items on the menu. On the other hand, the waitress was quite friendly, and with so many positive online reviews, I continued to hope for the best. First to our table was the Small Sashimi, which consisted of three pieces of Tuna Sashimi and two pieces of Sockeye Salmon Sashimi. The cuts were quite small, but the sashimi was a couple notches fresher than your standard Japanese restaurant. 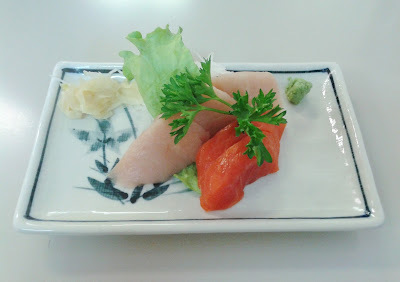 The Tuna Sashimi was not too salty and deliciously soft, while the Sockeye Salmon Sashimi had a nice buttery sweetness. The prawn tempura in the Dynamite Roll was quite hot when it arrived and had a rich taste. The sushi rice was well-constructed and didn't fall apart. My mom enjoyed this roll and decided to order another one toward the end of our meal! The Small Tempura came with two prawns and one piece each of carrot, zucchini, and sweet potato. I found the oil to be slightly overused, but the prawns had a good snap. The vegetables were sufficiently soft and each packed a decent amount of flavour. Seeing the abundance of teishoku sets (set meals) on the menu, I decided to try out some of them. 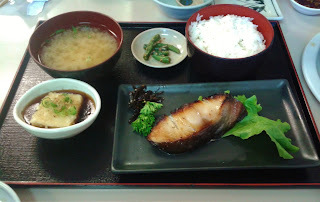 Pictured above is the Black Cod Teishoku, which came with Miso Soup, Green Beans (dressed with sesame sauce like goma-ae), steamed rice, Agedashi Tofu, and BBQ Black Cod. 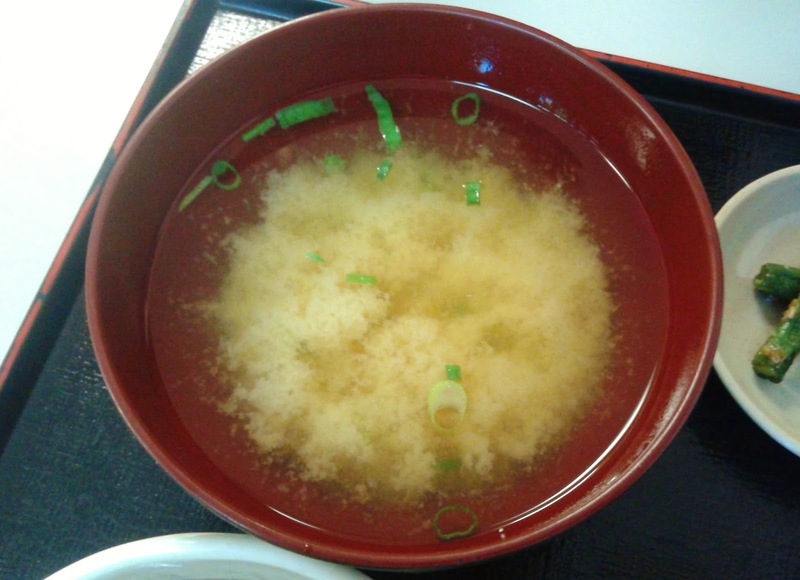 The Miso Soup was mild in flavour with green onion and tofu. 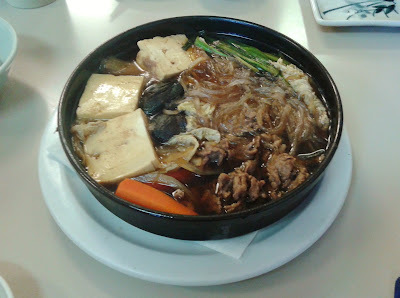 The tofu was not the smoothest kind, but there were no significant mishaps with the Miso Soup. 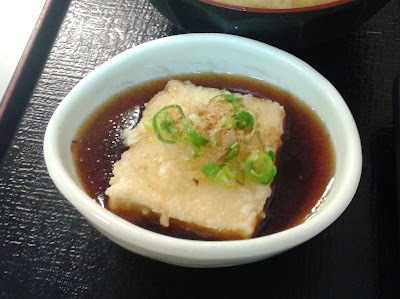 I found the Agedashi Tofu to be rather strange. The whole thing lost its crispiness from being soaked in sauce, and the batter tasted like flimsy flavoured plastic. Oh my dear lords. 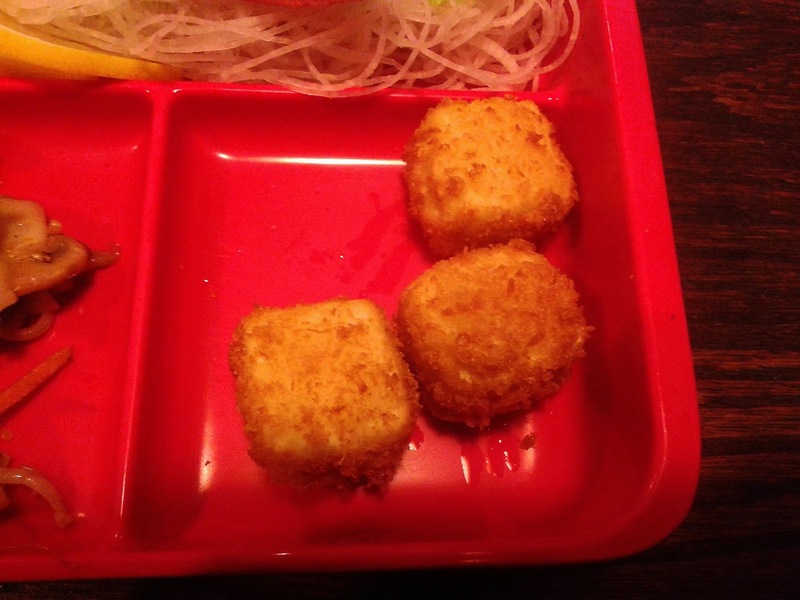 The tofu, on the other hand, had a decent soft texture. The Black Cod was the highlight of the whole teishoku, as expected. 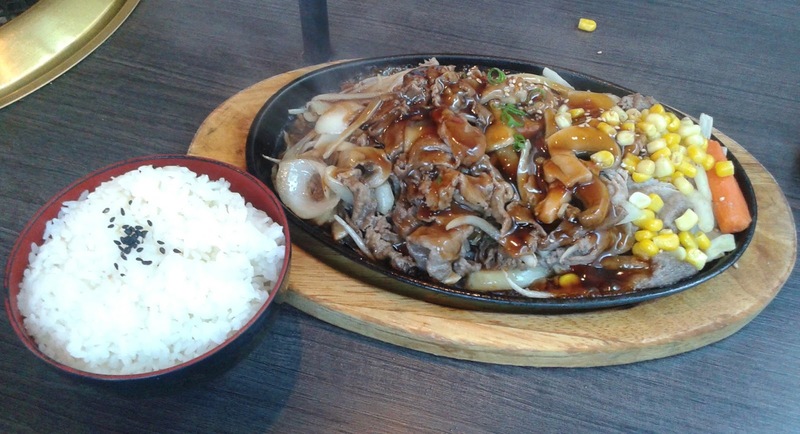 Served at a hot temperature with silky smooth meat, all of us enjoyed this dish. Yes, we did divvy it up into really small pieces. 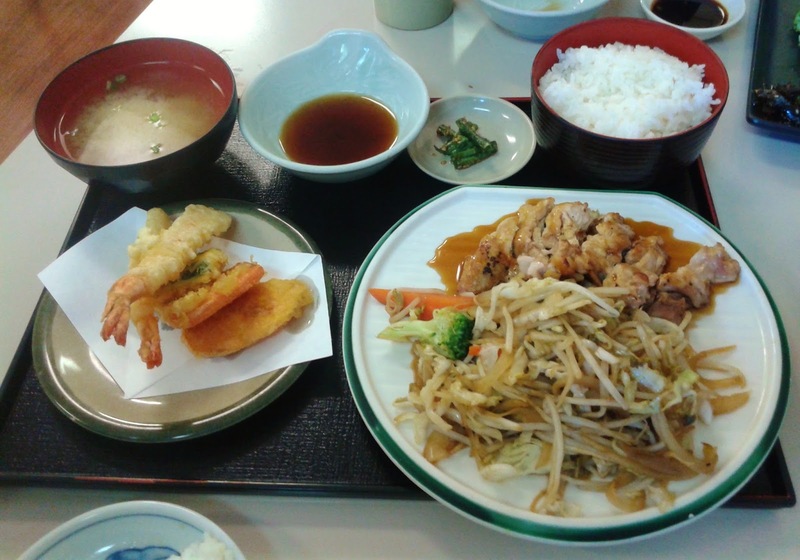 The other set meal that we ordered was the Chicken Combination, which consisted of Miso Soup, the same green bean with sesame sauce dish, steamed rice, Small Tempura, and Chicken Teriyaki. The chicken in the Chicken Teriyaki was mostly tender with no overage of sauce. 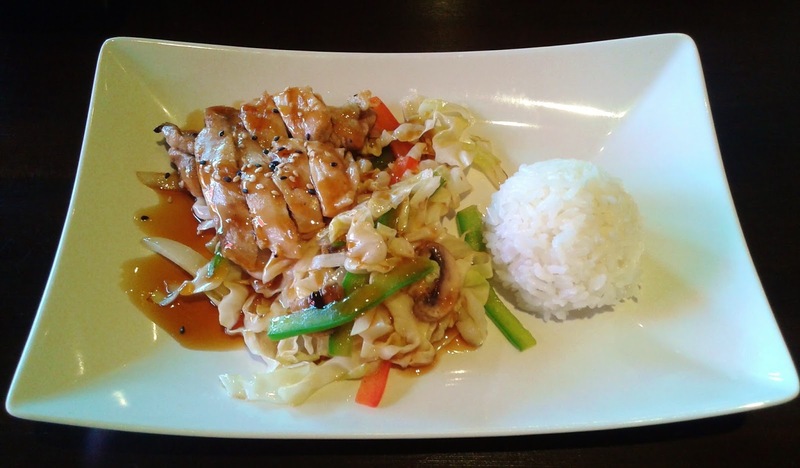 The mildly sweet teriyaki sauce brought out the flavours of the chicken well and livened up the mix of bean sprouts and cabbage. As mentioned above, I found the service to be quite friendly. 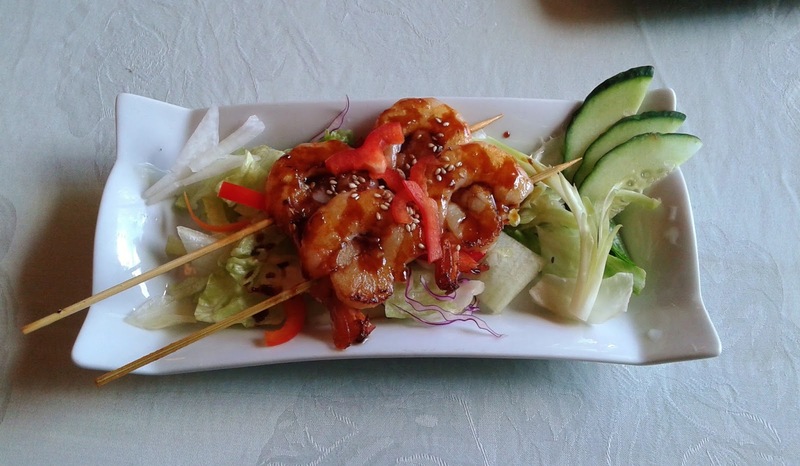 With the exception of the fried items, all of the dishes were above average in quality and prepared with care. The sashimi and the sukiyaki were the highlights of the evening. The prices do appear to be quite low on the menu, but the portion sizes are on the smaller side, hence the "Moderately Priced" rating. 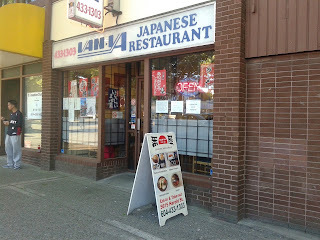 Van-Ya is one of the superior Japanese restaurants in the south part of Vancouver, and it is no surprise to me that the restaurant has stood for 27 years. While everyone else was having fun at the International Night Market celebrating with loads of delicious-looking food, I was stuck at home celebrating the two-week anniversary of my gracious mouth sore. That meant no fried or spicy goodies for me, but nothing stops me from having sushi. 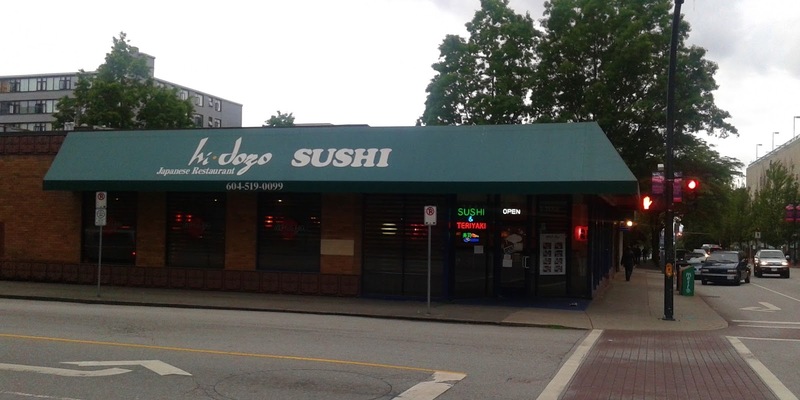 Not wanting to venture out too far, my dad drove me to New Westminster and picked Hi, Dozo Sushi based on appearance alone. Funny enough, this was the restaurant I was thinking of in my mind. Hi, Dozo Sushi is a moderately large restaurant situated in Uptown New Westminster. The staff cleverly placed the patrons so that the restaurant looked empty and deserted even though it was half full. However, the seating was quite comfortable as a result so I'll give them that. Looking at the menu, I found a large variety of dishes (including two pages of special rolls!). It didn't take me long to realize that pretty much every special roll and combo contained something fried, something spicy, or cream cheese. Oh great. 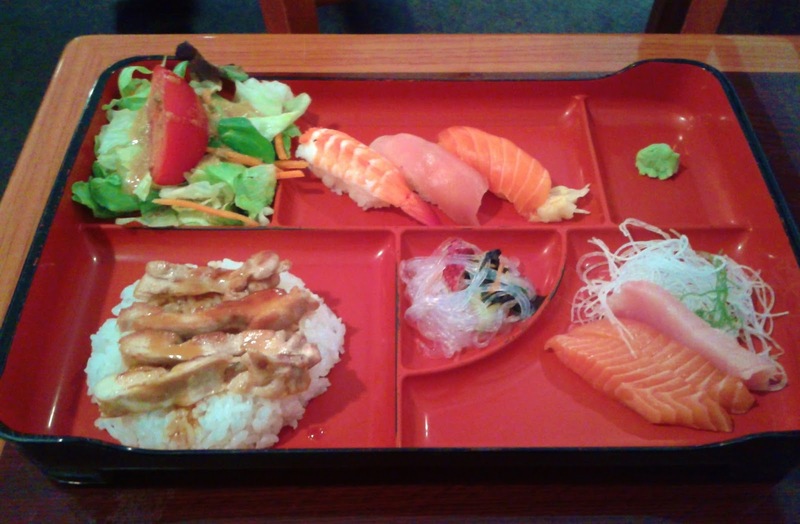 Not wanting to spend more for less, I got the Sashimi Dinner Combo, which came with Miso Soup, a California Roll, 8 pieces of sashimi, Chicken Teriyaki, Gomae, Agedashi Tofu, and Appetizer Tempura (some other choices are possible as shown in the picture above). A little fried food won't hurt, right? As mentioned in previous episodes, my dad pretty much only likes hot food, so I let him have the Miso Soup. He gave it a B, saying that it was a bit salty, lacking in green onion and tofu, and neither good nor bad overall. The rest of the dinner combo came in a large lunch box. There wasn't a chance that I could refrain from having any of the tempura, because it looked and smelled good. At the very least, I had that healthy slice of watermelon plopped in the middle to balance things out! 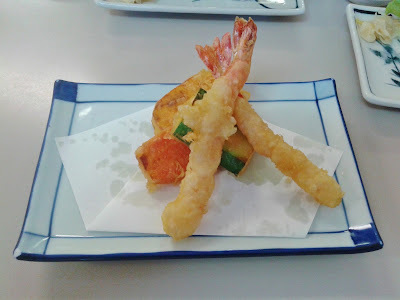 The Appetizer Tempura came with 2 prawns and 1 piece each of kabocha, green bean, yam and sweet potato. 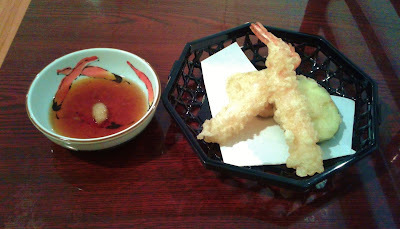 I found the batter to be a touch heavy in places, but other than that, there was much to like about the tempura. The prawns were rich and savoury in flavour and the kabocha, yam, and sweet potato had just the right amount of sweetness. 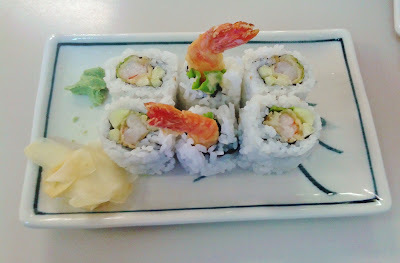 The California Roll was on the smaller side and otherwise quite typical. The avocado was sufficiently creamy and the crab meat was sufficiently sweet. The Tuna Sashimi had a balanced taste and displayed neat knife skills, but was not particularly soft. 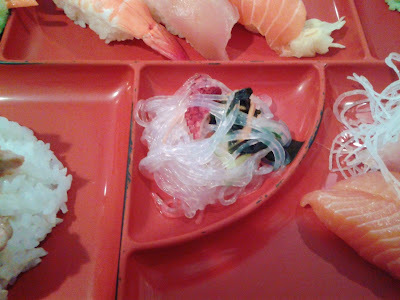 The Tai Sashimi was the best as it was fresh, not overly chewy, and had a decent sweetness to it. The Hokkigai Sashimi was cut to the right thickness and the Salmon Sashimi had a nice smooth sheen. The Gomae was pretty standard fare. The spinach was not particularly easy to chew, but the sesame sauce was adequately rich. The chicken in the Chicken Teriyaki was tender, but the sauce was terrible. The sauce had a gravy-like consistency to it and caused the skin to be very mushy. 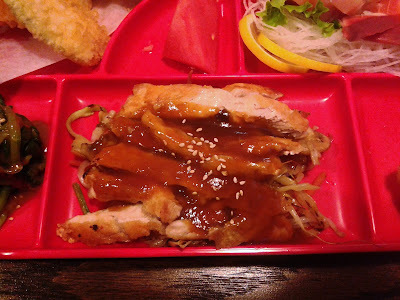 My dad, who normally loves Chicken Teriyaki, absolutely refused to eat it and went for the sashimi instead. Time for me to be the trash can. I had to mentally picture that I was eating turkey dipped in gravy to get through this obstacle. 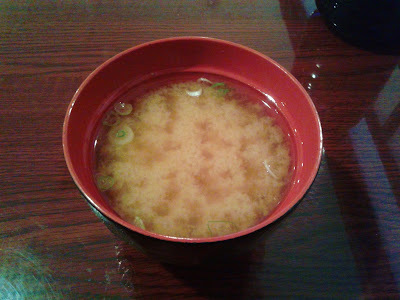 Unfortunately, the Agedashi Tofu was nowhere near as good as the tempura. I found the batter too crispy and the tofu rather bland. Maybe it would help if it actually came in some sauce. Not wanting to get a special roll too large for me to finish, I went for the Queen Roll, which came with smoked salmon, prawn tempura, yam tempura, avocado, and lettuce. The smoked salmon had a fresh taste and the tempura was well-executed. The avocado helped blend all the flavours together.